HorseRacingDVD offers FULL REFUNDS if you are not satisfied with your purchase. Just contact us within 21 days of your purchase date by email (horseracingdvd@yahoo.com) to notify us that you will be returning the item. Buyer pays all return shipping costs and when the item is received in the exact/same condition as when originally mailed out, HorseRacingDVD will issue a FULL REFUND to buyer. On DVD or VHS: Henryk de Kwiatkowski was a Polish-born member of the Royal Air Force who became a successful aeronautical engineer and established Kwiatkowski Aircraft Ltd. and Intercontinental Aircraft Ltd., headquartered in New York City. He made his fortune through leasing and brokering the sale of used commercial airplanes in North America and owned Calumet Farm from 1992-2003, one of the most prestigious Thoroughbred horse breeding and racing farms in the United States. In the mid 1970's Henryk de Kwiatkowski became involved in Thoroughbred horse racing and at his peak, he owned more than 60 horses. Two of the most famous and legendary horses owned by Henryk de Kwiatkowski are the subject of this time capsule: DANZIG and CONQUISTADOR CIELO. 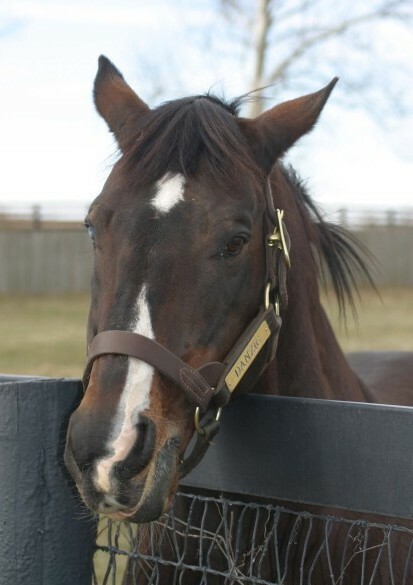 By the most influential sire of the 20th Century, NORTHERN DANCER, and out of the ADMIRAL'S VOYAGE mare PAS DE NOM, DANZIG (1977-2006) was bred in Pennsylvania by William S. Farish III and the late Marshall Jenney's Derry Meeting Farm. He was sold as a yearling at Saratoga for 310,000 to Henryk de Kwiatkowski in 1978 and was trained during his brief but brilliant racing career by Woody Stephens. 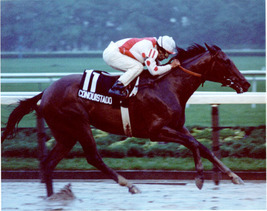 DANZIG demonstrated immense talent and showed great promise beating his rivals with such consummate ease on the track but in 1980 was forced into retirement undefeated in his 3-year-old season after winning all three career races because of an emerging slab fracture in his left knee in addition to being hampered by other constant troublesome health issues. However, DANZIG's racing career would pale miserably compared to his stallion career at Claiborne Farm as he would go on to become one of North America's most successful sires in the years ahead. DANZIG's three (3) career races are shown in their entirety: 6/25/79 - 2YO MSW 5-1/2F, Race #6/Belmont 5/14/80 - Allowance Race/Aqueduct 5/31/80 - Allowance Race 7F/Aqueduct CONQUISTADOR CIELO (1979-2002) was a son of stallion extraordinaire, MR. PROSPECTOR, out of K. D. PRINCESS (BOLD COMMANDER). He was a 150,000 yearling purchase of 1980 trained again by Woody Stephens for owner Henryk de Kwiatkowski. He had a brief but spectacular 13-race career that was compromised by shin injuries. He missed the first two Triple Crown races, the Kentucky Derby and the Preakness, but over a sloppy track won the Belmont by a widening 14 lengths. The miraculous thing was that CONQUISTADOR CIELO had just won the Metropolitan Mile by 7-1/4 lengths over older horses in 1:33 setting a Belmont Park record just five (5) days before his Belmont Stakes romp; his bold trainer, Woody Stephens, wheeled him back in less than a week solidifying his 1982 Horse of the Year title no matter what happened for the rest of the season. CONQUISTADOR CIELO also has the distinction of being the first of Stephens' unprecedented five straight victories in the Belmont Stakes. He would run only three more times after the Belmont, his career ending with a 3rd-place finish in the Travers Stakes. The colt was syndicated and retired to Claiborne Farm for a book value of 36.4 million, which was a record at the time. He won nine of 13 career starts and earned 474,328. "He was push-button (electronics) push-button - A roughly fingertip-sized plastic cover attached to a spring-loaded, normally-open switch, which, when pressed, closes the switch. Typical examples are the keys on a computer or calculator keyboard and mouse buttons. at three," said jockey Eddie Maple. "As he matured he carried that speed and he turned into something amazing." CONQUISTADOR CIELO's seven (7) most major wins are shown in their entirety: 1981 Saratoga Special / Saratoga - 1) CONQUISTADOR CIELO 2) Herschelwalker 3) Timely Writer 5/19/82 Allowance Race / Belmont - 1) CONQUISTADO CIELO 1982 Met Mile / Belmont - 1) CONQUISTADOR CIELO 2) SILVER BUCK 3) STAR GALLANT 1982 Belmont Stakes / Belmont - 1) CONQUISTADOR CIELO 2) Gato del Sol 3) ILLUMINATE 1983 Dwyer Stakes / Belmont - 1) CONQUISTADOR CIELO 2) John's Gold 3) Reinvested 1982 Jim Dandy Stakes / Saratoga - 1) CONQUISTADOR CIELO 2) Lejoli 3) No Home Run 1982 Travers Stakes / Saratoga - 1) RUNAWAY GROOM 2) Aloma's Ruler 3) CONQUISTADOR CIELO 41 Minutes. Thanks for looking. Winning bidder pays 6 shipping and handling.